Derek works for an ad agency downtown. He's from the Midwest and since moving to Seattle has taken up surfing. In the six years he's been out here, Derek has developed quite the quiver, to include this 10' pig he shaped himself. 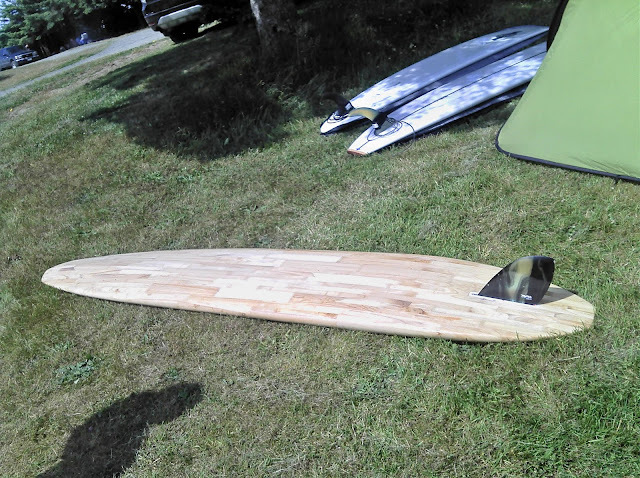 Made from dovetail pine, Derek glued, shaped and glassed the board at his house in Edmonds. It is a retro pig shape, and weighs nearly 70lbs. It has a rather large rear, a deep-v hull, a huge single fin and a narrow nose. According to Derek, riding it is a lot like standing up in a canoe. I was thoroughly impressed with his craftsmanship and would love an opportunity to ride the pig.